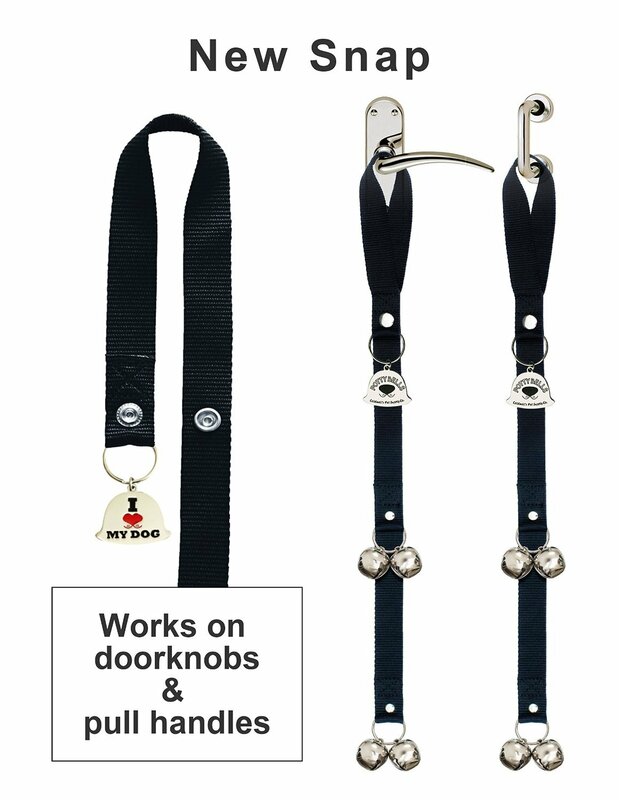 Your dog is going to love her potty bells. It’s amazing for her when she has a clever and reliable way to get your attention. You’re going to be pretty impressed when she rings her bell and patiently stares at you, waiting for you to take her for a potty trip. Using potty bells is your dog’s first lesson in communicating with you. When she learns this skill, she will feel closer to you, knowing she can depend on you to understand her needs. You can start this training with any pup or adult dog. It only takes a few sessions for most dogs to catch on. The potty bell is going to be a permanent installation in your home. It needs to always be available for your dog to ring. Install the potty bell on the door you use to take your dog out. If you have multiple doors, you can get multiple bells. 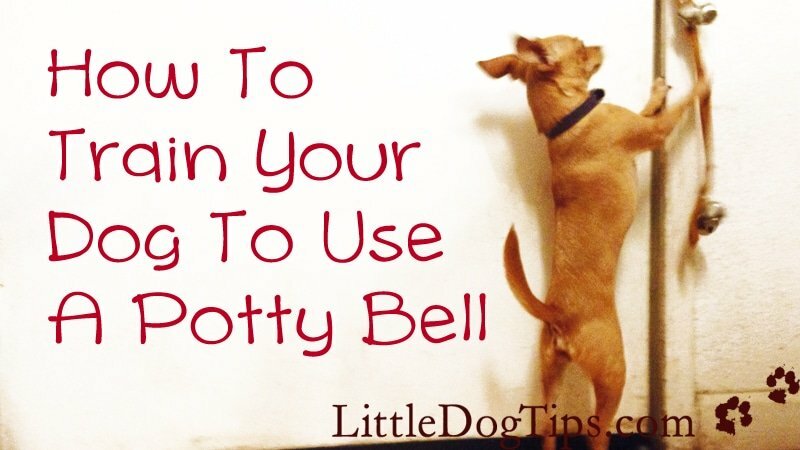 I recommend the Original Potty Bells because they are long enough for short dogs to reach, and they have a snap so you can hang them anywhere and take them with you on-the-go. 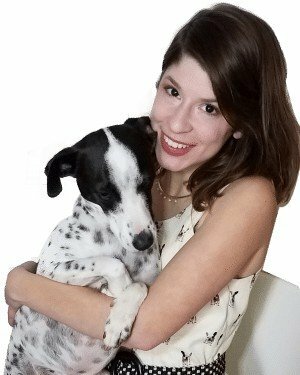 You do not necessarily need to have a potty bell to teach your dog to communicate when she needs to go outside. You can also have her spin, bark, or do anything to get your attention. The principles are the same: you must have your dog complete the action right before you take her outside. However, you can hear potty bells from another room. This makes it easy for your dog to get your attention when you’re not closeby. When you first install the bell, lure your dog near it with some treats. Give her a treat whenever she approaches the bell. Praise her for the tiniest jingle. Small dogs might be afraid of loud, scary bells – at first. Once your dog discovers the power they will have over you when they ring the bells, they will lose their fear very fast! At this stage, just make sure your dog knows how to use the bell. She will choose to either tap it with her paws or her nose. Using a command is optional – your end goal is for the dog to ring the bell on their own, without a command. But it may be easier for you to get the dog to use the bell if you say a command. You can say, “Bell!” or “Ring!” and then praise your dog when they jingle their bell. Once your dog seems to have a bell-ringing method down, move on to the next step. 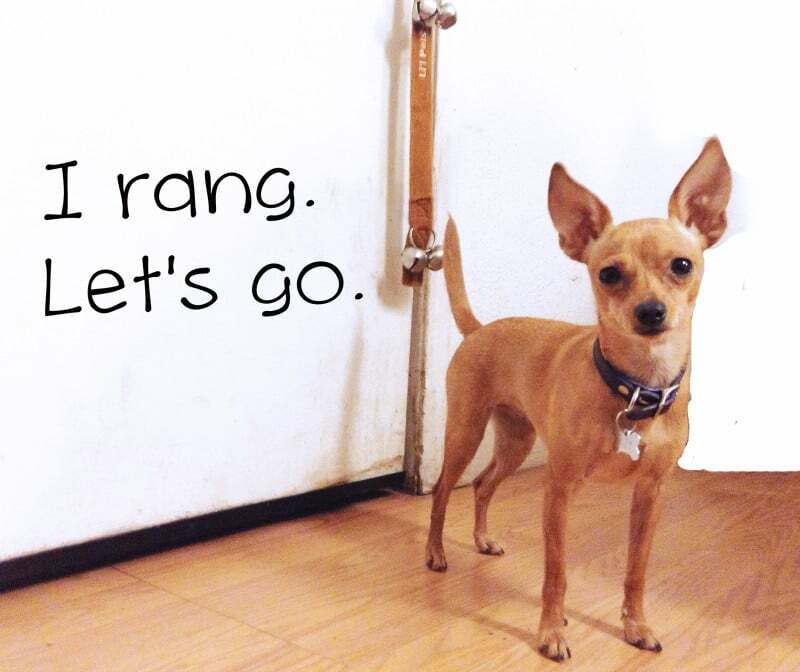 Now that your dog knows how to use the bell, command her ring it immediately before you take her outside. Do not give them any more treats for ringing. Instead, provide an immediate cause-and-effect by opening the door the moment they ring. Phase out the command as your dog begins to ring the bell on her own. Be consistent. Take the dog out EVERY TIME she rings the bell. Even if she hits it by mistake. Even if you just took her out. It will not take long for your dog to realize that whenever she rings the bell, you will take her outside. Should You Ignore Excessive Ringing? When your dog realizes that you take her out every time her bell rings, she will ring the heck out of that bell. She will ring it when she sees a squirrel, and when she wants to go out and play. If you have an excessive ringer, make sure that when you take her out, you are on potty duty only. Do not let her chase squirrels, and do not let her play. Each bell ring results in a trip to her potty spot, or a quick potty walk – not a free-for-all outdoor playtime. If your dog rings when you only just took her out, she could just need to poop again. She could even have a urinary tract infection, causing her to need to pee many times – she’ll need to be treated by a vet, in that case. Only ignore your dog’s ringing if you’re sure she won’t have an accident, and if you know she just wants to chase the birds outside. I’d never heard of a “potty bell” before, thanks for an informative blog post – I learnt a lot! My husband has always wanted to teach our dogs how to do this and I think it is a great idea. This is great! Terrific step by step instructions and such a beneficial training aid (and empowerment!) for the dog. 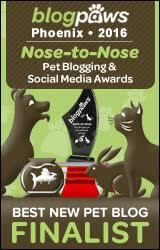 My pal Carlie could benefit from this post! She has a bladder the size of a pea and is always needing to go out. This way she wouldn’t have to cry every time she needs to go out she can just ring the bells. This is a perfect potty bell training lesson. This makes potty training so much easier when they learn to use the bell. Thanks Suzanne! I love, love, love how she finally started communicating with me. I tried training Mr. N to use the bells. He prefers to stare at us and run to the door though. My daughters dog uses our bell all the time, my two dogs don’t use it at all. I find that so interesting— they have no interest at all in ringing it even though we did the same training with all of them. That’s interesting! Our second dog didn’t even need training, she just noticed how quickly we get up when the bell sounds. That’s adorable, I love when dogs turn our training around on us. Matilda knows we’ll ignore her sometimes, but she often follows up with a big, angry ring, lol. Yeah, what a wonderful potty bell ringing training write up! We haz a potty bell….but we missed the first step of treating to ring! We went with ring and go outside…but I don’t think we got dat going outside was special…cuz den we’d go outside and has to be told to potty. You separated da actions – dat is so smart!! I’ll have to teach Kilo. He has such a small bladder and he loves peeing on white bath mats or white carpet. I take him out every 2 hours and remind him. If he thought he’d get treats, he’d probably go once an hour – he is a pug after all. I really love this. I trained my Corgi to use a potty bell. It didn’t take long to train him and it worked perfectly. A fabulous idea, that’s for sure! Good tip! I have a bell at two different levels to accommodate both the mastiff and the Littles. Thanks! That sounds adorable!! Thank you. What a great idea! One of my dogs isn’t very good at letting us know she has to go. She holds it in for a very long time and then starts growling or barking. A bell would be nice! I don’t think Matilda rings the bell when we’re not home, because every time she rings them, she stares at us wagging her tail. It’s how she communicates, so I don’t think she rings for nobody, but I can’t be sure! That’s a great question. I need to try this. Our dogs whine at me and it’s one of those sounds that really set my teeth on edge. Think I’d prefer the bell. Hahaha! You’d love the ringing, then! I taught my dog to ring a small cow bell. It took only one time. Awesome, what a clever pup! Our newest addition has been extra difficult in the potty department think I’m going to give this a try. Thanks for the idea! I need help, my dog Chewie knows how to ring the bell, and will definitely ring it, but he doesn’t ring it on his own to let me know he needs to go. When I am working, or at home, I need for him to let me know. Right now he will only ring it when I get up and tell him it’s time to go “outside” “potty” and when I walk over to the door. I don’t feel like he is fully potty trained until he can let me know that he needs to go outside. I don’t know what to do. Any suggestions? It did take a while for Matilda to start ringing on her own. What helped was, I’d go near the bell but not ask her to ring it, slowly phasing out the prompt. It also helps to open the door a crack immediately after he rings, so he makes the connection that the door opens when he rings. Thanks a lot for your great helps! I am cheating though!! 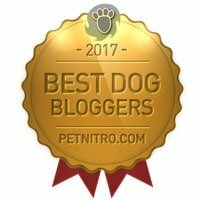 These have worked miracles for my two standard poodle five month old brothers! !